We want to build a whole new world, and we want to build it on a radically different ideological basis from that of the present world. In order to do so we must contend with the most determined and even fanatical opposition from the carriers of the Judeo-liberal-democratic sickness and from all those with a vested interest in the present System. Unfortunately, our opponents are able to marshal overwhelming forces against us and have almost unlimited resources at their disposal. Their chief strength, of course, is their monopoly control of the mass media. Not to be forgotten, however, are their dreadful power of the purse and their ability to deploy all the police powers of the state against us. We are at present not only a minority but an unpopular minority. If our fellow Americans had not been hypnotized by the mass media, most of them would find themselves in agreement with the ideals for which we stand. But the Enemy has managed to raise a barrier of fear and misunderstanding between us and the public, a barrier which we must break down. Although a national awakening is already beginning, until we have been able to completely overcome the insidious effects of the Enemy’s brainwashing of our fellow Americans – and that is a task which must be measured in years – we must count on the continued indifference or hostility of many of those we are trying to reach, and we will remain a minority, albeit a growing one. 1) FUNCTIONALITY. The Alliance must grow in a functional way. Its form and structure must be determined, first, by its primary task, which is the propaganda of our message of hope for a spiritual rebirth and a new life for our race; and, second, by its secondary task, which is to provide, eventually, the complete organizational framework for a new society and a new government. In other words, we are and will remain, first and foremost, a propaganda-making organization. We understand the term propaganda in its broadest sense, including both propaganda of the word and propaganda of the deed – in short, all feasible means for capturing the hearts and minds of our fellows. community which it will one day replace, a state within the state which it will one day supersede. 2) MASS ORIENTATION. The Alliance must have a mass basis of support and of participation in its program, and it must keep is propaganda oriented toward a mass audience. It must avoid dependence for its support upon the representatives of any single special interest, and it must not restrict its appeal to any segment of the population defined in terms of occupation, income, age, geography, educational level, or present ideological orientation. 3) PERSONALITY. From the generalized mass which responds to its appeal, the Alliance sifts out those most capable of strengthening its cadres. The structure of the organization must always be such that the man or woman with greater understanding and self-discipline is able to fill a proportionately greater role in its program and make a larger contribution to its efforts than those less well endowed. 4) UNITY. The Alliance must be monolithic in purpose, in doctrine, and in strategy. Although it draws its recruits from left and right, from both radical and conservative elements of the population, and although it utilizes them in many different ways and to many different degrees, it must keep them always directed toward the common purpose. 5) FLEXIBILITY. In tactics the Alliance must remain completely flexible. Any means are permissible in achieving its ends, so long as the means do not contradict the ends. Though our purpose remains unchanging, we may change tactics from day to day or use different tactics in different places at the same time. Our doctrine is based on the eternal and God ordained laws of Nature, but our tactics are based on the demands and the resources of the moment. The ways in which these five principles of organization are applied to the structure and growth of the Alliance cannot be fully discussed here, but a few illustrative examples can be given. The principle of functionality lies behind the relative emphasis given to the production and public distribution of ATTACK!, as opposed to other activities which might receive this emphasis instead. An ultra-left group, such as the Symbionese Liberation Army, can kidnap someone or blow up a government building, and the news media will glamorize that group and disseminate its message to the public. That doesn’t work for us, however. If we want the public to recognize and understand us, we must reach them through our own channels of communication. Since our aim is to replace existing institutions with our own, we must develop the basis for a smoothly functioning propaganda machine which can grow and diversify and become stronger until it if effectively competing with the controlled media for the attention of the public. The principle of mass orientation has not played as large a role in the growth of the Alliance as it will in the future. When the economy is functioning smoothly enough so that the average citizen can maintain his accustomed standard of living, it’s hard to attract his attention to even the most urgent racial, social, or political issues. The world may be crumbling into ruin around him, but so long as he can sit in front of his TV set with his beer, he doesn’t care. Only a racially conscious minority will respond to the appeal of the Alliance under such conditions. [T]he Alliance provides a maximum opportunity for individual initiative on the part of its members. Those who seize this opportunity are able to play a leading role in the development of the Alliance. Those who do not will never be artificially boosted into leading positions. But when the economy falters, the masses become more receptive to criticism of the System and more willing to consider alternatives. There has already been an increase in emphasis on economic issues in our propaganda in the last few months, and the future will see a further shift in this direction as well as the introduction of new propaganda techniques more suited for reaching a mass audience than our previous efforts. Our mass orientation affects the choice of our means of propaganda as well as its content. Thus, we have shifted from mailing as the primary means for the dissemination of our propaganda materials, to street distributions. Mailings generally go to a minority which has already given some evidence of a particular ideological orientation, whereas street distributions reach everyone. The principle of personality stems from a recognition that human history is a record of the thoughts, achievements, and deeds of exceptional individuals. Applied to the structuring of a society or an organization, it tells us that the most progressive structure is the one which has built into it a mechanism of natural selection for bringing those individuals of greatest ability and will into positions of leadership. Thus, the Alliance provides a maximum opportunity for individual initiative on the part of its members. Those who seize this opportunity are able to play a leading role in the development of the Alliance. Those who do not will never be artificially boosted into leading positions. Authority within the Alliance is always earned, never bestowed as a favor. The policy of the Alliance, which consists of members widely distributed geographically, is maintained through the leading role played by the National Office. 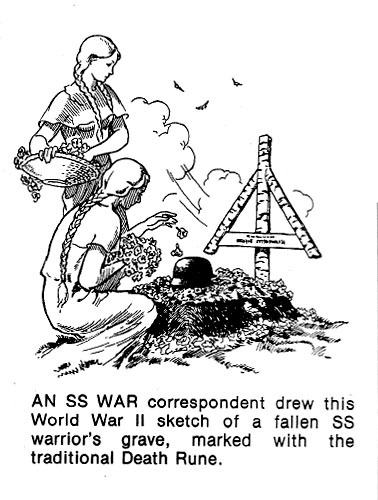 Although individual members and Action Units often produce their own leaflets dealing with local issues and otherwise engage in propaganda on their own initiative, ATTACK! provides the ideological guidelines for everyone. An interesting psychological phenomenon on which I have commented on in several issues of the BULLETIN is that displayed by people who send hostile letters to the National Office saying, in effect: “You people claim to be Christians, but you ignore the teachings of the Bible, which says that all races are the same. Don’t you even know that Jesus was a Jew?” They have had the idea planted in their heads that the Alliance is some sort of Christian organization, presumably by Jewish propaganda linking us to Christian Identity and Catholic traditionalist groups, which also are on the Jews’ hit list. Reading our material or listening to one of my broadcasts should persuade them otherwise, but it doesn’t. It probably took quite a bit of effort by the Jews to pound the idea into their heads, and it’ll take dynamite to get it out. Unfortunately, one can observe a similar phenomenon in many people nominally on our side, even in some Alliance members. I have announced over and over again our policy toward other organizations, and I nevertheless continue to receive letters to the effect: “All of us in the ‘movement’ must stick together. We should unite with all of the other patriotic organizations, and then we’ll be much stronger. Etc.” To me this view indicates either hobbyism or a serious deficiency in the writer’s powers of discrimination. If you don’t remember what hobbyism is, re-read section 3.c.iii.2 of your copy of the Membership Handbook. The Internet has given many inadequate people the ability to pretend to be more than they are. Any troubled teenager or unemployed alcoholic can get a web site, set himself up as a phone-booth Fuhrer, and begin collecting “followers,” and many do. They are the ones to whom the Simon Wiesenthal Center and the Southern Poverty Law Center are referring when they announce that “the number of ‘hate groups’ on the Internet is now 457, up 23 per cent since 1999.” Two outstanding examples are a teenaged Jew named Andy Greenbaum, who used the name “Bo Decker” and set up an “organization” he called “Knights of Freedom”; and a professional disseminator of disinformation named Harold Covington (a.k.a. “Winston Smith”). Greenbaum self-destructed last year, when he announced a giant march in Washington and only two of his “followers” showed up for the march. Covington occasionally still makes Internet attacks on the Alliance, but he is far less prolific than he was a year or so ago. There are dozens of others who are still active, however. One is a TV repairman in California named Tom Metzger, who publishes a tabloid addressed primarily to skinheads and prisoners called “White Aryan Resistance’ (“WAR”). Metzger promotes an ideology that is a blend of racial nationalism and class resentment, commonly called “national bolshevism.” Another, also in California, publishes a newsletter called “The Nationalist Observer.” Both are proponents of an “strategy” known as “leaderless resistance,” according to which, at the appropriate time, hundreds or even thousands of revolutionary cells, consisting of one to five patriots each, will materialize spontaneously and will overthrow the government by sabotaging or bombing government and media facilities and assassinating politicians, leading Jews, collaborators, and other enemies of our people. All of these cells will operate independently, without centralized organization or direction or infrastructure, so that it will be nearly impossible for the government to infiltrate them or spy on them, and the government never will know where or when they will strike next. Actually, Metzger and other “leaderless resistance” advocates are not so much in favor of “leaderless resistance” as they are against any sort of organized activity. Their thesis is that any organized activity is certain to fail because it will be infiltrated by government informants and provocateurs, and that any racial patriot who joins an organization is a fool who is allowing the government to get his name on the blacklist for unspecified, but presumably severe, reprisals. All of this theorizing takes place in the make-believe world of revolutionary hobbyism. In the real world, “leaderless resistance” is simply an excuse for losers, cowards, and shirkers to do nothing except talk to each other. Building an effective organization of any sort is difficult work, and those who don’t like work or who have tried to build an organization and failed often are resentful of any effort that shows signs of success. Their reasoning is, “I tried it and wasn’t successful; therefore, it can’t be done.” And the reason that nearly every organizational effort has failed has not been government spies or provocateurs; it has been the low quality of the human material in the organization. Certainly, the Alliance has never had any damage done to it by government agents. Every major difficulty we have had has been the consequence of bad judgment or bad behavior on the part of a member. It’s always difficult working with people. It must be a real nightmare trying to run an organization that has no quality standards for membership and that maintains a flamboyant and sensationalist public image attractive to hooligans, drunken brawlers, criminals, sociopaths, and other losers. It’s a little hard to say exactly what the term means to the Internet gossips. To most, it seems to be a clubby sort of concept which includes all of “us” and excludes everyone else. Although I have found the term useful in some contexts in the past, it probably should be abandoned because it has been so badly misused by the hobbyists. Really, what self respecting racial nationalist wants to be considered part of a “movement’ which includes all of the phone-booth Fuhrers, the Internet gossips, and an embarrassingly high quota of born losers? It’s easy enough to understand this club mentality. As our society disintegrates under the onslaught of Jew-instigated multiculturalism, people look for something to hold onto: a sense of belonging, of community. We feel more secure when we have a sense of solidarity with others of like mind. A comforting sense of security is not the primary thing that Alliance members should be seeking, however. We want strength. We want new capabilities. We want to gain an advantage over the enemies of our people. We want anything which brings us closer to victory, whether it is comfortable or not. The truth of the matter is, there’s not much advantage to be gained inside the “movement.” It is too heavily freighted with chronic losers, incurable hobbyists, phone-booth Fuhrers, and other defectives. Perhaps the “movement” is no worse than the general public in this regard, but we’re looking for the best and strongest people we can find, and we find them much more often outside the “movement” than inside it. It is time for all members who have been focused on the “movement” either to reorient themselves in an outward direction or to find another organization to devote themselves to. As our tempo and our work load increase, being in the Alliance will be less and less fun for those whose primary aim is to amuse themselves with “movement” gossip. And I will have less patience with hobbyists and with those who believe that the Alliance is part of the “movement.” Our aim is not to be the biggest and best organization in the “movement”; it is to leave the “movement” to its clubby introspection while we get on with the job of building a revolutionary infrastructure. We respect our martyrs, and all of those who have shown courage or made sacrifices for our people, but we’ll build monuments to them after the revolution. Meanwhile, winning is all that we care about, not the fun of playing the game by “movement” rules. Printed on the inside cover of each NATIONAL VANGUARD is the statement: The symbol which appears in the NATIONAL VANGUARD logotype is the Life Rune. It comes from an ancient alphabet, or futhark, used in northern Europe for many centuries before the general adoption of the Roman alphabet there. The Life Rune signifies life, creation, birth, rebirth, and renewal. It expresses in a single symbol the raison d'etre of the National Alliance. Like the cross and various sun signs, the symbol is an ancient one. Over 3,000 years ago the Germanic peoples of northern Europe carved it on rocks, along with other pre-runic figures, perhaps as a sign of a man with arms reaching upward and addressing the gods. Later -- something between 2,000 and 1,800 years ago -- the Germanic peoples began using a script having 24 characters, with both phonetic and magical-symbolic values, called runes. These were organized in a system known as the "futhark." The name "futhark" derives from the initial sounds of the names of the first six runes, that is: feo - ur - thurs - asa - rit - kaan. This is similar to the way in which the word "alphabet" comes from the names of the first two Greek letters, alpha and beta. 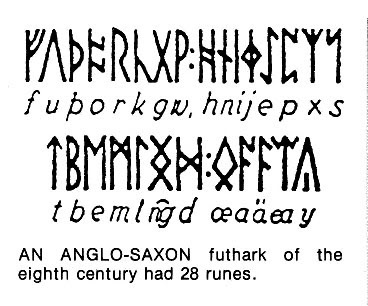 In addition to the original Germanic futhark, there were two principle later runic systems: the expanded Anglo-Saxon, with up to 33 runes; and the reduced Norse, with 16 runes. Although many runes are common to the various futharks, the names and phonetic values of a given rune are not always the same. Most runic characters were made up of straight vertical and diagonal strokes to facilitate their carving on wood stone, and metal. Over 5,000 runic inscriptions have been preserved. Although these were scattered by Norse rovers from Greenland to Greece, the vast majority of them are found in Sweden. Many of these are carved on commemorative monuments, or rune stones. The more efficient Roman alphabet eventually supplanted the futhark for most purposes throughout northern Europe, but runes continued to be used in a few places -- especially in Scandinavia -- as late as the 17th century. The origin of runes and the futhark is as murky as the water in the depths of today's polluted Rhine. The evidence is sparse, and scholars disagree in their interpretations of it. Some authorities speculate that the futhark simply derived from German contact with Greek or North Italic writing, about 2,000 years ago. Others suggest that the futhark and the various southern European alphabets come independently from an older, common European script. Many German, Greek, Roman, and Etruscan characters did have similar forms. For example, the figure we call the Life Rune occurred in the early Greek and Etruscan alphabets, as well as in the Germanic futhark. It even has been proposed that the futhark must have been the brainchild of one man, rather than an evolutionary development, much as the Gothic alphabet was the creation of Bishop Wulfila, and the Cyrillic alphabet was the work of St. Cyril. Each rune had a name related to the sound of the character: names like "hail," "ice," and "birch." A single rune could stand for its name-word itself, as well as for the sound associated with that word. It was thought to have magical powers that could be used to evoke, or protect against, the force contained in that name. Runes were often inscribed on weapons, tools, and rings to give them talismanic powers. The 15th rune in the original Germanic futhark is the one with which we are especially concerned here. It appears variously with diagonal strokes pointing upward, downward, or in both directions. All these forms represented the same sound, originally "z." Rune masters wrote individual runes up or down, left or right, without distinction. Nor was there any single convention for the direction in which lines of runes were written. The symbol we call the Life Rune was not known as such in futhark times. In the original Germanic futhark this rune was known variously as the Axe Rune and the Elk Rune. It signified defense. Later, in the reduced Norse futhark of the Viking Age, a formal dichotomy developed. The arms-upward rune was known as the Man Rune and had an "m" sound. The arms-downward rune had the strong palatalized "r." It was called the Yew Rune or "bow made of yew wood," a symbol of death. The medieval Christian church used the Axe Rune/Man Rune form as a variation of the cross. They simply bent the arms of the Latin cross upward at about a 45-degree angle to form a stylized crucifix, known as the forked cross. The shape is also suggestive of a tree. Gregory the Great, who was Pope from 590 to 604, wore a forked cross on his vestment. Fork-cross crucifixes are common in Westphalia and parts of Austria and Italy even today. Conversely, enemies of Christianity -- Saracens, Satanists, and others -- bent the arms of the Latin cross downward to signify the crucifix broken. Scandinavian and Anglo-Saxon Christian churchmen were, in some respects, tolerant of Germanic tradition and dabbled in the use of runes as script. However, in the 17th century Iceland people were burned as witches because runic inscriptions had been found in their possession. 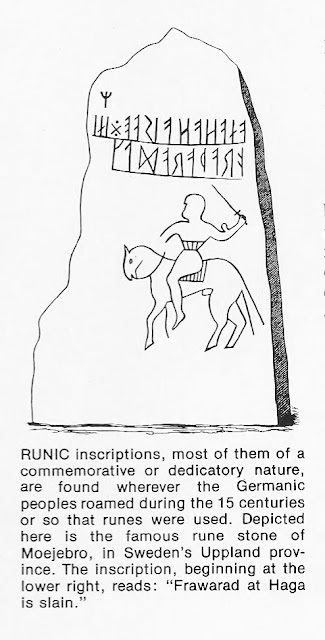 An official prohibition of the use of runes was thought necessary in 1639. 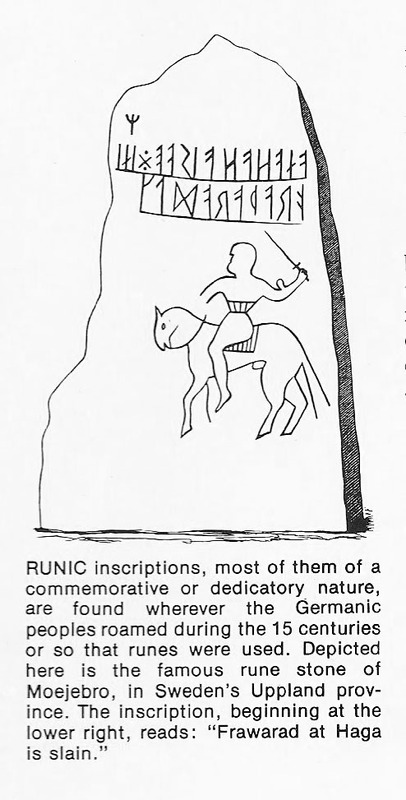 About that time many runic monuments were destroyed in Britain. Long after futhark times, runiform designs served as identification and decoration marks. Axe Rune/Man Rune forms were not uncommon as heraldic devices on family coats of arms. The Romantic movement of the 19th century generated a renewed interest in things heroic, Norse, and runic that is still with us today. 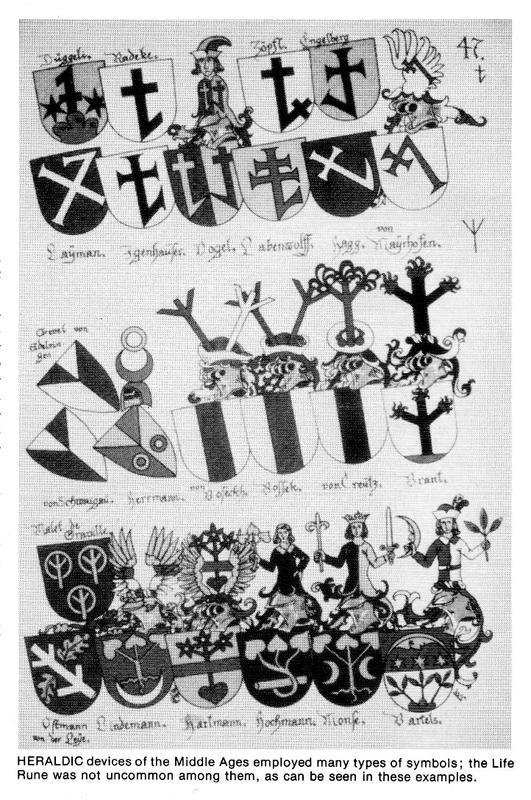 The designation of the Norse Man Rune as the rune of life and the Norse Yew Rune as the rune of death is principally a formulation of the late 19th/early 20th century Romantic runology of Guido von List and other German rune mystics. In Germany, Life and Death Runes were used in newspaper obituaries, death notices, and on gravestones: The Life Rune by the date of the person's birth and the Death Rune by the date of his passing. 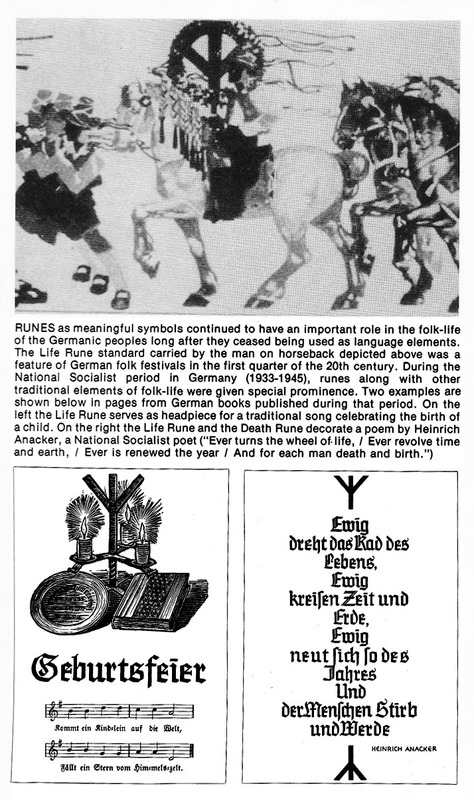 The National-Socialists were inspired by the rune lore of their remote Germanic past, and they made use of the Life Rune and Death Rune in many aspects of their cultural life. Runic emblems were also a prominent feature of National-Socialist military and civil service regalia. Among the runes used were the Tyr Rune (after the Norse god of war for whom Tuesday is named), the Sun Rune, and the Life Rune. 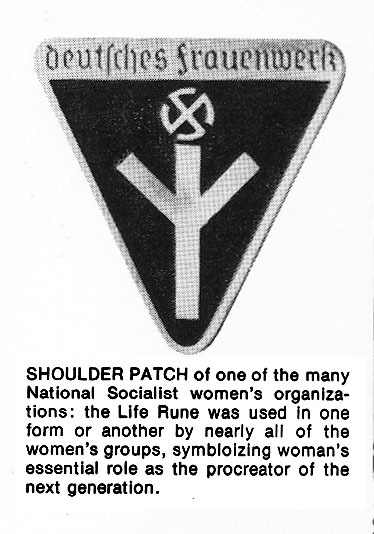 The Life Rune was used to identify members of National-Socialist women's associations, welfare workers, and medical personnel in a number of organizations. The designers of the emblem conceived for the nuclear disarmament movement in the late 1950's -- later known as the "peace" symbol -- were aware of the Death Rune context. They described their design as a highly stylized human being with arms only slightly raised from a downward position in an attitude of hopelessness: a gesture-of-despair motif. They knew it was of ancient origin and signified the death of man. 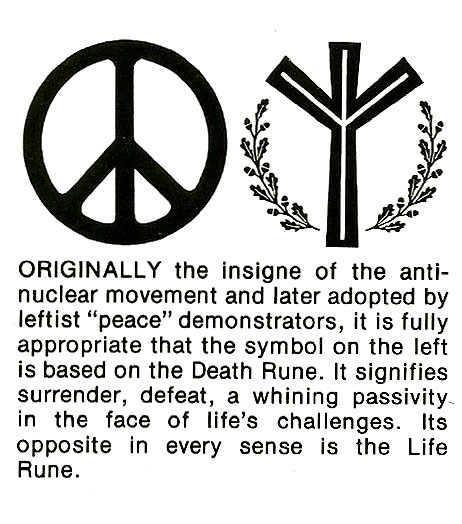 When asked how the Life Rune is related to the more familiar peace symbol, one can describe the relationship as one of opposites: the one is related to the other as up is related to down, as life is related to death. Like heads and tails on a coin, both are aspects of the same reality. This, briefly, is the heritage of the Life Rune, used today as the symbol of the National Alliance, as well as of some groups in Europe. The Life Rune is an ancient, sacred sign of our folk. It has had different aspects and meanings. Now it is up to us to give it yet a new one: to make it the emblem of White resurgence everywhere. The Life Rune stands for man with arms uplifted. It stands for man reaching upward toward higher man. It whispers to us from the past and beckons us toward the future. The Libertarian movement, nurtured in part by widespread disgust or disillusionment with the two major parties and in part by its adherents' yen to be associated with an imagined political and intellectual elite, has expanded in recent years. Most new recruits seem to be gathered from that somewhat nebulous group known as Yuppies: television-weaned, city-centered folk under 40 whose major pursuits in life are a full enjoyment of the standard items on man's pleasure menu, as well as rapid job advancement in some high-tech or otherwise glamorous industry, interrupted occasionally by est encounters, visits to the racquetball courts, and libertarian meetings. Libertarianism fits the spiritual vistas of many Yuppies like their Calvin Kleins fit their bods. It combines comfortable elements from their radical youth with the nervous economic conservatism of their maturity, and all of it is dressed in the flattering garb of profound philosophy. The high priestess of libertarianism is the late Ayn Rand, a one-time Hollywood screenwriter and the author of long novels dramatizing her philosophy, known as "objectivism." The salient thesis of Randian thought is that the individual human mind is the prime mover of all progress, and anything that would fetter or restrict it is part of a "collectivist" drag back to primitivism. Government exists -- or should -- solely to enforce contracts between free individuals, and perhaps to provide for the common defense, although no one is obligated to pay for the defense or to serve in the armed forces. Libertarians in practice strongly oppose drug control, immigration laws, gun-control laws, social-welfare programs, and taxation. They favor unlimited and uncontrolled capitalism in all its forms. The type of society favored by libertarians seems to be a sort of loosely-contained anarchy: each intelligent, self-seeking, rational mind goes quietly and peacefully about its business, pursuing its own objectives, not disturbing or interfering with the objectives of other free and rational entities. Government, such as it is, will be called upon only to arbitrate contractual disputes. While any citizen so inclined can ship himself off to boot camp in order to keep the armed forces going, the ultimate defense against "collectivist" oppressors is . . . an elitist strike. Those possessors of the freest, most rational, and most inventive brains simply will refuse to continue to exercise their competence and ingenuity in the service of "collectivists." After their strike causes the lights of civilization to go out, lo, the objectivist heroes will get into harness once more, having demonstrated to the unappreciative herd the errors of its past ways. Rand manages to impart a certain appeal to these concepts in the pages of her emotional romances. But the entire movement, from its seminal ideas to its political expression, is a trap for deracinated fools. "Objectivism" is a soul-state for urban Americans dominated by a highly personal and economic Weltanschauung. It is not political thinking at all, merely a thinking about politics. It is, at bottom, a poltroonish mirage for those who will not face the grim facts about a world teeming with hostile non-Whites (who would slaughter with glee all elitists "on strike") and an America rapidly sinking into a multiracial quicksand. The libertarian is oblivious to the fact that present racial trends, if permitted to continue, will at the very least put an end to his treasured concepts of unlimited frontiers, endless space, and wild freedoms, those nostalgic mind-sets that abet the growth of puerile nonsense such as libertarianism. Rand and most of the early objectivists were Jews; thus the preference for an anarchic bourgeois condition and the primacy of economic thinking. The Jewish communist and the Jewish libertarian may seem to be in violent opposition, but with the emphasis on the material and on what is considered to be the "rational," the two are alike, though one may seek the end of "justice" and other that of "freedom." Both are hostile to movements built on national, racial, or cultural instincts. Those who are attuned to facts, to reality, and whose living, race-based impulses are Western, Faustian, will smile -- horselaugh, perhaps -- at Rand's transparent stupidity and at the pathetic childishness of her followers. Were it not for a tax-supported police force, and for the tax monies that go into the monthly welfare checks, the impoverished urban non-Whites would rise in the night to murder all objectivist Yuppies faster than one could say, "Who is John Galt?" Let the libertarians continue to weave their fantastic, gossamer webs. Let them add their bit to the chaotic factionalism of America, this bizarre whirlpool with a hollow death at the nadir. The static rationalist concepts of prissy "objectivists" will drown in the steaming vortex; schemes about going "on strike" against mindlessness will bring one day only a sad, head-shaking smile to those who once held them dear. Libertarians quack loudly and long about "rational thinking," but in reality their program discourages fact-based thinking on the part of intelligent Whites, a few of whom might otherwise be capable of thinking their way through to a realization of their dire straits. Instead, the libertarian movement offers them only a sugared, gingerbread ideology, which will crumble instantly at the first full-blown, feral blast of the dragon's breath. 1 Ayn Rand, The Virtue of Selfishness (New American Library), p. 172.